Most people believe PDF files are an electronic replacement for paper. If they create a PDF file from a scanned document or a Word file to e-mail, they believe the content of that file is locked down and not editable, just as if they were handing someone a piece of paper. Many companies today use PDF to distribute and view documents. There is one problem associated with PDF files: they tend to be rather large especially when they contain both text and images which may lead to increased bandwith consumption and longer network transmission times. Content compression can be as simple as removing all extra space characters, inserting a single repeat character to indicate a string of repeated characters, and substituting smaller bit strings for frequently occurring characters. This kind of compression can reduce a text file to 50% of its original size. To PDF files, compression refers to image compressing. Compression can be either lossy (some information is permanently lost) or lossless (all information can be restored). Here are some of the best PDF Compressors & PDF Compress Software. Compress PDF file and reduce the actual size of PDF document with this high quality PDF Compressor. Nice PDF Compressor removes duplicate PDF objects, optionally takes advantage of new compression features of latest PDF specifications that for many classes of documents compresses 30 - 60% better than what is possible in PDF 1.5. 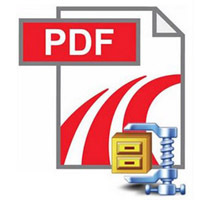 Nice PDF Compressor allows you to shrink PDF file by using Flate or RunLength compression algorithm. With this software, you are able to set the compression level to generate PDF files of the smallest size. PDF document are compressed internally, but the author might used old technology or have generated it by inefficient PDF creating software, and as a result be much larger than necessary. Now, you can use Magic PDF Compressor to compresses PDF documents in order to further reduce their file size. Compression ratios vary widely, from 0% to 99%. Compact PDF is a new format that can give an additional compression of 30 to 60% on many classes of PDF beyond what is possible in PDF 1.5. For instance, a PDF document shrinks from 12.2MB down to 4.4MB in Compact format. No information is lost in obtaining the additional compression, in contrast to some methods that throw away structural or other information or use lossy image compression. The end user needn't care how the change occurred, that means they can open, read the PDF documents as usual. PdfEdit995 is an easy-to-use utility for pdf995. PdfEdit995 is part of the Pdf995 Suite of products. They offer a complete solution for your document publishing needs. PdfEdit995 offers a wealth of additional functionality, such as: combining documents into a single PDF; automatic link insertion; hierarchical bookmark insertion; PDF conversion to formatted HTML or DOC (text only); integration with Word toolbar with automatic table of contents and link generation; autoattach to email; stationery and stamping. The PDF Compression Module can be accessed from the Web View tab in pdfEdit995. It allows you to compress PDF files to reduce file size. In order to use the PDF compression module, Signature995 and the Standard Encryption module must also be installed. PdfEdit995 Download. PDF Split Merge Page BoX helps you split, merge PDF documents and edit PDF document pages. Get a preview from selected PDF document with PDF viewer. It can merge two or more PDF documents to create new PDF document, or merge selected pages from two or more PDF to create new PDF document. It also can split selected PDF document to create new single or multi page PDF documents. eDocPrinter PDF Pro creates PDF files from applications in Windows 2000, Windows XP, or above. It works as a printer under windows environment, hence users can print from whatever application utilizing windows GDI printing device. eDocPrinter PDF Pro provides basic functions like compression, font embedding, and document information setting. It gives fully support of TrueType Font embedding. By native Unicode support, it handles DBCS (CJK, Chinese, Japanese, Korean) correctly, including subset embedding and vertical layout support. Hence users can print multilingual documents from English Windows versions. CoolPDF settings do not require much tweaking to get the quality, resolution and file size you want, and this is easily done following the menu or the manual that comes with the software package. Encryption features are available for advanced users who want to secure a PDF document by setting a user password and owner password or simply setting user access permissions to protect the PDF document from printing, modifying, copying, filling, extracting, assembling or annotating. A-PDF Image Downsample provides a quick way to resample the image in Acrobat PDF documents directly. A-PDF Image Downsample reduces the size of PDF files by reducing the resolution of those images to match specific quality requirements and by compressing the images. Then it makes PDF files to read faster on web. It supports both lossy and loss-less compression.